IN 1943, WHEN HE WAS BROUGHT TO CADDIE AT PINEHURST for the first time on his 10th birthday, Willie McRae got a few words of advice from his father, also a caddie. Seven words, to be precise. Today, the old caddie’s mantra is to be applied only among the most stoic of clients. At the ceremony Wednesday night to induct the second class of caddies into the Pinehurst Caddie Hall of Fame, the effusive praise of each inductee’s presenter illustrated a vastly different experience in these relationships forged on the grass – recollections that included joy, laughter, and, in a couple of quiet reflective moments, a few tears. But the caddies themselves? As usual, they seemed content to let their golfer do the talking, even on their biggest night. And so while the great McRae’s presence was certainly felt – the ceremony opened with a moment of silence to remember the genial looper who died in October – his father’s advice did in fact make its way from the caddyshack all those years ago to the St Andrews Room of the historic clubhouse. The new hall-of-famers showed up. When their names were called, they kept up. But when their presenters finally shut up, each honoree quietly exited the stage and away from the glaring spotlight – as if they were simply walking off the 18th green of Pinehurst No. 2 at dusk. Leave it to the quietest of them all, John Ross, who has been caddying at Pinehurst for 64 years, the longest tenure of any caddie currently at Pinehurst, to set what became the preferred tone for all of the evening’s inductees. And with that, Ross turned and shuffled off the stage. The audience, though, many of them Ross’s fellow caddies, greeted his 4-second address with thunderous applause. What more needed to be said? If the caddies themselves were going to remain quiet and humble, the stories were still going to be told for them. Ross was joined in the second class by fellow caddies Bobby Hill, Bob Scheirer, Thomas Trinchitella and Caddiemaster Jimmy Smith. Caddies Jesse Jones and Charlie Spain were inducted posthumously. A member of the inaugural Hall of Fame class in 2001, Jimmy Steed won three North & South Opens as Sam Snead’s caddie in the 1930s and 1940s. Steed died in 1985, and his family was unable to be located for the first ceremony in Pinehurst 17 years ago. On Wednesday, Steed’s niece Connie West wand grandson Junior Lewis were on hand to celebrate Steed’s career. “(Steed) was the best caddie I ever had,” Snead said in 1994. Todd Camplin, a former Pinehurst golf professional who had Spain on his bag during the 2011 PGA Championship, told of one harrowing moment he and Spain – who was missing two fingers on one hand – shared on one of golf’s biggest stages. 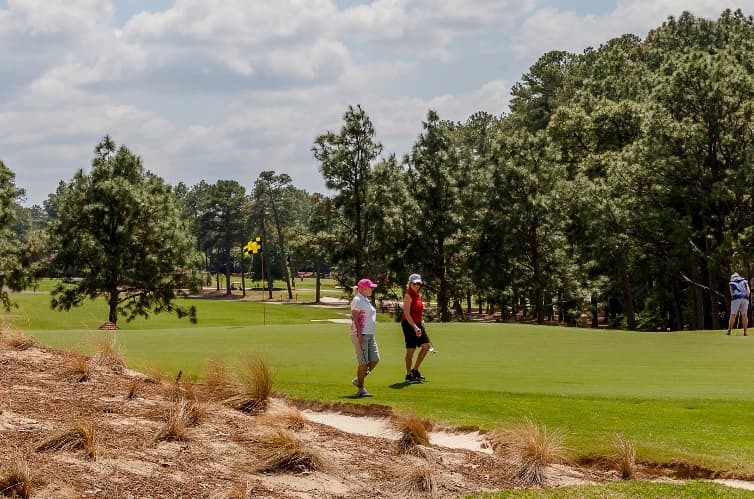 “I had hit a great shot into a long par-3 that was bordered by water, and I’m puffing my chest out a little bit as we’re walking to the green, though both of us knew all the double bogeys would be coming later,” Camplin said. “Feeling pretty good about myself, I walked up to mark my ball and went to toss it, all in one motion, to Charlie. All of a sudden, I see him lunge for it. It’s headed straight for the water, which, if you don’t know, would’ve been the most embarrassing penalty for replacing a ball. Somehow, Charlie got in front of it. There were poignant moments, too. Former Pinehurst President Donald Padgett II presented for his longtime caddie Trinchitella. “Anytime we ever had a special person, for whatever reason, who needed a caddie, I always said, ‘I have just the guy – Thomas,’” Padgett said. “When Tiger was here? Thomas. Rory? Thomas. Keegan? Thomas. The President of the United States? Thomas. “I can say I’ve had three of the best caddies ever here at Pinehurst. One was Fletcher Gaines. Another was Willie McRae. Former Pinehurst Golf Professional Jeff Crabbe presented for Jones, effectively summing up the evening with one particular memory.